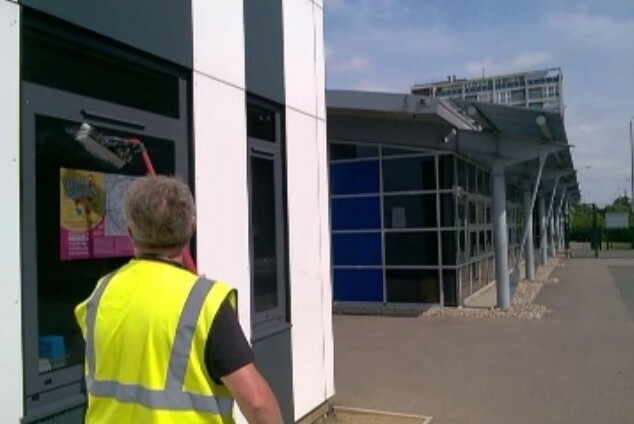 School Window Cleaning is normally carried out once a year during the summer holidays, when there are no children around including the teachers, generally just the caretakers are on site ensuring all the major works get carried out. I guess no one gives a thought to how all this work takes place and when, the school just feels cleaner and neater somehow. Schools throughout the UK come in all different shapes and sizes, from small village junior schools up to the large colleges in the cities. Old Victorian schools to new futuristic looking schools. They all have one thing in common as far as we are concerned, windows, lots of them and they all need cleaning inside and out. Its a fact that children learn better when the classrooms are flooded with bright natural light, they are more focused and motivated to learn, there cheerful and thats good. So nice clean windows improves the amount of light that comes in through the glass. 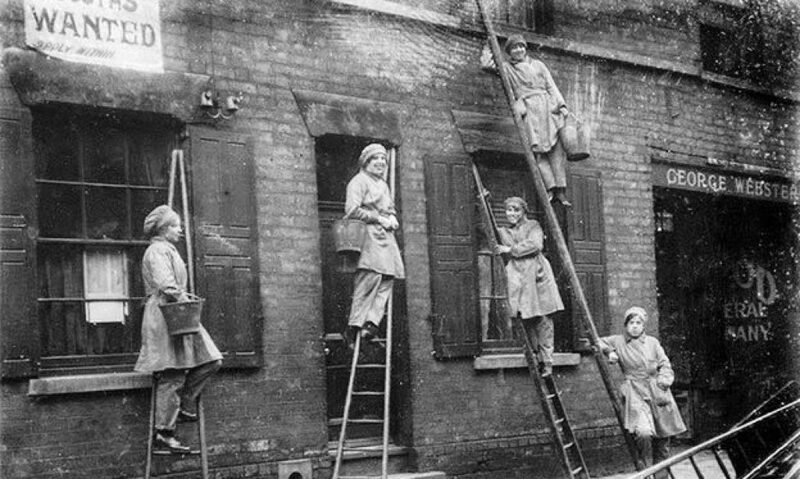 I love looking at the old pictures from years gone by of window cleaners climbing the longest ladders you have ever seen in your life, black and white or sepia tone photographs of cheerful men and women scaling old Victorian schools with metal buckets and chamois cloths doing a great job, think they called them shiners back then. OK so this is not a school but its typical of its time. Nowadays as a window cleaner its frowned upon bringing a ladder onto the school premises, it creates panic and alarm in the caretakers face! And where do you think you are going with that ladder? he may say, do you have the proper paperwork? He is referring to the RAMS you sent in before work commenced, Risk assessment and method statement, you never mentioned using a ladder, it is just like that. As far as Im concerned its a good thing, I’ve been cleaning school windows for 28 years now and the last thing I want is a broken leg, arm or even worse. So how do window cleaners clean school windows these days? They use the telescopic water fed pole system, I personally have been using it since its inception some years ago and its great. What I really love is how it is much quicker, safer and efficient it is, all the frames get a good wash as well, plus you can literally go beyond the reach of most ladders, cleaning windows with your feet still firmly on the ground. Here are some videos that will help you get a good idea of how we clean school windows. Im am really sorry about the quality of these videos there really poor, I need to update them but they both illustrate well how school window cleaning can be accomplished safely. So in a nutshell we carry water to the school in large tanks fitted to our vans. Why not use tap water you might be thinking from the schools many taps dotted around. The water we bring to the school is purified, in other words all the solids have been filtered out, making it highly absorbent. Bird muck literally disintegrates as it is soaked, brushed and rinsed off. We use a RO membrane, carbon and paper filters and finally resin to polish, leaving no solids in the water. In fact if you have the bright idea of taking a bath and getting the wife to through in a toaster thats connected to the plug socket you should be OK, much to your wife’s disappointment, the reason being is it is the solids in the water that conduct the electricity, so you live to see another day and clean many more windows. Stop! your not actually going to try it are you?? So pure water is pumped out of the vans tank, along a 100 metre hose reel and up the water fed pole that is connected, out of the jets in the brush, the operative brushes the windows, agitating all the dirt and grime, and lastly rinses off leaving the window to dry naturally. Some residential customers might screech out “Arnt you going to squeegee them off?” No they are left to dry naturally, I believe car washes use the same technology, rarely does anyone chamois off the water from the car after it has been cleaned in the car wash.
Water fed poles can come in any size or length from 18 feet to the modular 80 feet poles! Thats crazy 80 feet, we are talking 8th floor, amazing, imagine the savings on renting an expensive cherry picker. This entry was posted in accounting services, Latest Updates, window cleaning by admin. Bookmark the permalink.